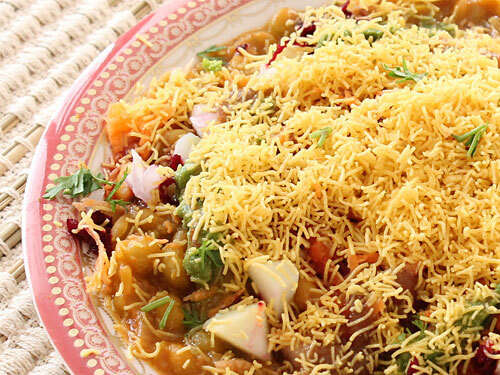 Prepare the ragda by following this recipe. 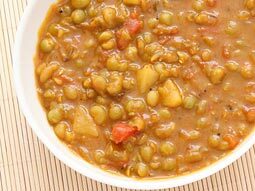 Prepare all chutneys by following their recipes and dilute garlic chutney by adding 1 tablespoon water in 2 tablespoons chutney. 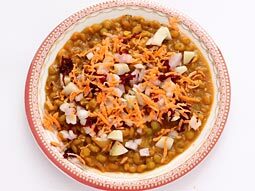 Transfer hot ragda in individual serving plates and top with 2 tablespoons chopped potatoes and 2 tablespoons onion. Sprinkle 1 tablespoon grated beetroot and 1 tablespoon carrot over it. 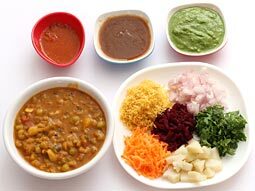 Top with 1 tablespoon green coriander chutney, 2 tablespoons sweet chutney and 1/2 teaspoon garlic chutney. 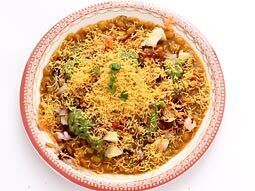 Sprinkle sev (if you like more sev then sprinkle as much as you like) and coriander leaves over it. Serve immediately. 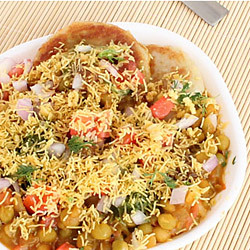 You can prepare ragda in advance and heat it again at the time of serving. You can add more potatoes for variation in taste. Serving Ideas: Serve it as afternoon snack or party snack. It can also be served as a light evening dinner. It is particularly enjoyable in evenings during monsoon and winter. Loved this recipe. Its yummy, easy and filling.Thank you so much. 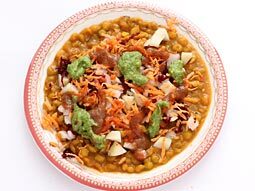 i liked this gujarati sev usal recipe very much. I am from baroda and this snack is like must have breakfast on every sunday for my husband. 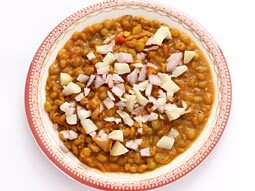 till now my husband used to get it packed from outside but then last week i planned to surprise him on his birthday by preparing it and after lot of research on net, i decided to follow this recipe as it had also links to preparing ragda and its associated chutneys. Its simply fantastic as my husband exclaimed after taking first bite.